Defender Anita Asante has criticised England boss Mark Sampson for failing to explain why she has been dropped. Asante, 30, who plays for Swedish side Rosengard, has 70 caps and featured at two World Cups and three European Championships. Despite a call-up a year ago, her last appearance for England came in 2014. "I don't know why. That's for him to answer. We haven't really had much contact since last year, so that's difficult," Asante told BBC Sport. "You want to maintain some level of communication but so far that hasn't happened." The Football Association have said they do not comment on individual selection cases, but also confirmed that Asante featured in a behind-closed-doors friendly for England before last year's World Cup. England strikers Lianne Sanderson and Jodie Taylor, who play in the United States, are regularly picked by Sampson but Asante feels playing abroad may have affected her chances of a recall. 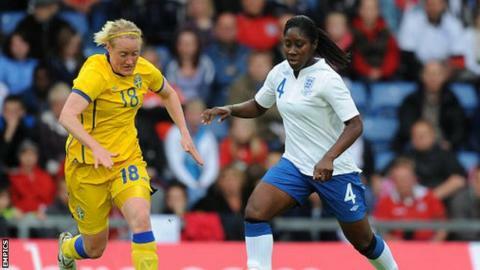 The former Arsenal and Chelsea defender also says that no-one from the England coaching staff has ever been out to Sweden to see her in action. "Maybe it's a little bit hard for them to see me play often or even take the time to come out and watch me," she said. "But if you want to see good talented players play for your national team, then you will try to make the effort to see English players playing all over the world." Asante, who can either play in defence or in central midfield, previously spent 10 years at Arsenal where she won 12 trophies with the club, eventually moving to play in the US in 2009 and then Sweden in 2012. FC Rosengard, where Asante has played since 2013, have qualified for this season's Champions League quarter-finals. Among her team-mates in Sweden is five-time Fifa player of the year Marta. Despite her exclusion from the national set-up, Asante says that she has no immediate plans to return to England. "I'd never say never, but right now I'm really enjoying my time in Scandinavia," she said. "But we'll see what the future holds. "It's always an honour to play for your country and if I get the opportunity again, I would obviously jump at the chance. "At the moment that isn't the case but I'm just going to keep working hard at my club."